There’s been a spike in silicosis cases caused by exposure to dust created when cutting stone kitchen benchtops, leaving workers debilitated and facing an uncertain future. ABC’s 7.30 exposes what it means for workers and their families. Silicosis is a lung dust disease that comes from exposure to silica dust. The emergence of silicosis in workers cutting stone kitchen benchtops is alarming. 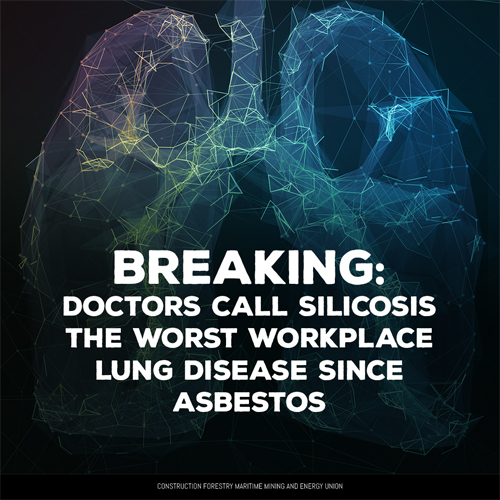 Doctors have called silicosis the worst occupational lung disease since asbestos. 22 silicosis claims were lodged in the last month in Queensland, and that number is expected to reach the hundreds in the coming months. If you would like to join the campaign, or are concerned about silicosis, please fill in the below form to receive regular updates and information. You can also indicate if you work in construction or mining.